Bovine Viral Diarrhoea (BVD) is a highly contagious viral disease of cattle caused by the pestivirus. It causes huge losses in terms of reduced herd health, fertility, production and abortion. It is estimated that over 90% of the national cattle herd have been exposed to the virus. 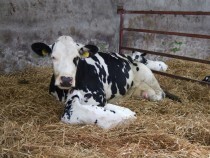 Estimated costs of disease are between £13 and £31/cow/year. This insight publication looks at possible solutions for control and eradication in your herd. insight publications replace the Farming Notes which have been produced by Kingshay since 1991, publishing on issues critical to the success of a modern dairy farm business. These briefings which now include dairy insight, business insight and research insight, provide dairy farmers, large animal vets, farm consultants and other interested parties with the most important and timely information in a concise two-page format. The information contained in our insight publications is written and updated by our experts to ensure accuracy and save you time. A selection of insight publications and Farming Notes are available to buy individually from our online shop. To gain access to all our publications become a Kingshay member.